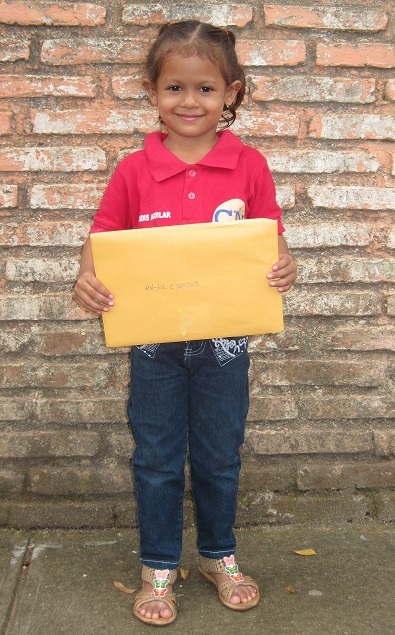 Have You Written Your Sponsored Child(ren) Lately? This is one of those tasks that falls into the same category as “shake your vanilla extract,” “dust your ceiling fans,” and “sort the piles of paper on your desk.” We know we need to get around to it, but other pressing to-dos – like “make sure everyone has clean underwear” – keep pushing those down on the list. Here’s a friendly reminder and challenge for us all this weekend: Write a letter to your sponsored child. It will only take a few minutes. It is always enjoyable. Your kids can be involved. And you know, without a doubt, that your letter will bless the child who receives it. 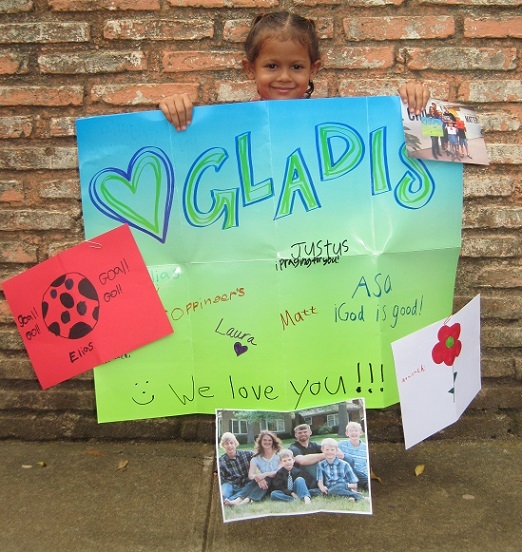 Here’s our little girl, Gladis, holding a package from us last summer. How excited she must have been to know that everything in that envelope was hers! If you’re not yet sponsoring a child, please join our ministry here at Heavenly Homemakers! You’ll be amazed at what your monthly donation of $39 can do to meet the needs of a child. And your prayers specifically for them are huge. Let’s all be a part of this rich ministry together. I am wondering how you were able to send an envelope so large!!! We signed up to sponsor a child as well through this organization, and the directions we were given said everything had to fit inside a 9×4″ envelope. That is just a business-sized letter envelope. Can’t fit much in there! I initially attempted crayons and coloring book, but after reading the instructions more carefully, I realized the book was too big and they don’t want crayons because they can melt in those hot countries. So … I crammed stickers and a few colored pencils into a 9×4 envelope instead and the postman told me I had a “small parcel”. We are still waiting to hear from our child, but I know it can take a while. Meanwhile, the kids are very faithful to remember to pray for him (even more so than the adults!) This is a great opportunity to help kids be more “other- centered” and have a heart for those outside their little world as Jesus did. Thanks for sharing about it! Usually, we don’t send anything that large. We “got away with it” that time because we were visiting the One Child Matters headquarters and they took it directly with them on a trip. :) I’ll share more specifics next week of how it works and what to send. She’s adorable! What did you send in the package she’s holding? Thank you for the reminder Laura. 3 of our kids have Compassion “friends,” which I know is not the organization you guys have gone through. I love the prayers from our kids for these sweet ones so far away. They love to get letters from them. I so often let it slip my mind for too many weeks between our letters to them! Doing it this weekend! Thank you.